Time and again, I’ve posted on the effectiveness of customer case studies. 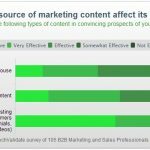 But now, there’s more evidence that they not only work, but also that they’re one of the least expensive content marketing. . .